You can play both videos and audio files in a browser. You won’t require any third-party proprietary plug-ins or codec to embed videos in your web page. With the advanced HTML 5, your web page can store larger files and much more data locally on the host’s computer. The markup language is designed to follow the DRY (Don’t Repeat Yourself) principle, so it focuses on clear codes while avoiding unnecessary repetition. 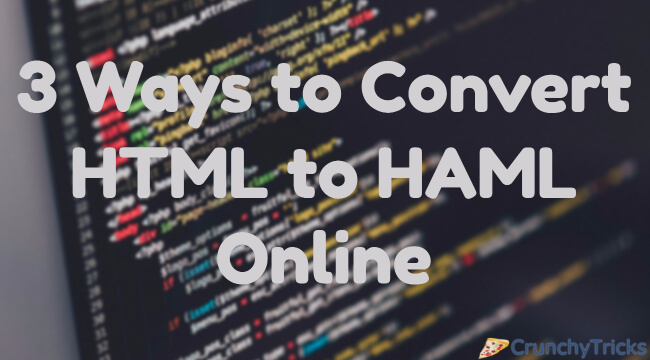 You will see an option “convert HTML to HAML.” Open it by clicking on it. Or you can directly jump to this page by clicking on this link. Or else, you input the whole HTML text into space which is below the text “Html (paste your HTML code and press convert).” Then click on “Convert.” In the next honk space provided below it, you will find your HTML text converted to haml.